Tripp Lite P131-06N-MINI allows you to connect a device with Mini HDMI output, such as a Laptop, Tablet, or SmartPhone, to VGA display devices, such as Projectors. Supports resolutions up to 1920x1080 ( 1080p ). Small, compact design, no external power required...completely Plug-and-Play. Don’t settle for less than the best—enjoy superior video quality! 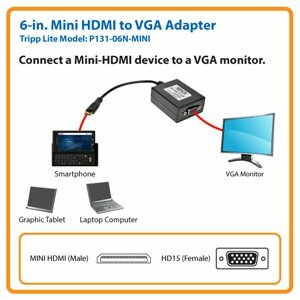 Tripp Lite’s P131-06N-MINI Mini-HDMI to VGA Adapter ensures peak performance when displaying a Mini-HDMI video signal on a VGA display. Use it to connect devices such as a laptop, tablet or smartphone to a VGA monitor or projector. Unlike cut-price cables and adapters, the P131-06N-MINI is manufactured to exacting specifications, using superior materials, for a difference you can see. It supports resolutions of up to 1920 x 1080 (1080p). For peace of mind, the P131-06N-MINI comes backed by a three-year warranty and has a green, RoHS-compliant design. The P131-06N-MINI offers an easy, inexpensive solution for converting the video signal from a Mini-HDMI port for display on a VGA monitor. Featuring 1 HDMI male connector and 1 HD15 male connector, this adapter is ideal for home theater applications. The P131-06N-MINI is constructed of top-quality materials. Gold-plated contacts offer optimal connectivity. Double-shielding with foil and braid provides maximum EMI/RFI protection and superior signal quality. Molded connectors and integral strain relief guarantee long life and durability. With no external power or drivers required, the P131-06N-MINI offers plug-and-play convenience. Simply plug it in, and you’re ready for action. All you need is a Mini HDMI-enabled device and a VGA display. Should you need auxiliary power, however, there is a built-in Micro-USB port for connecting a power adapter. The P131-06N-MINI is manufactured in compliance with strict RoHS specifications, reflecting Tripp Lite’s commitment to environmental responsibility. For peace of mind, it comes backed by a three-year warranty.